Each year many drivers passing through Manhattan are issued a ticket for reckless driving. Some of these tickets are issued on pink sheets and are made returnable to the 346 Broadway Criminal Court. It is important that a person charged with this crime consult with legal counsel as soon as possible. A conviction to this charge can have many adverse consequences including but not limited to a jail sentence, a permanent criminal record, and significant fines. VTL § 1212 Reckless driving. Reckless driving shall mean driving or using any motor vehicle, motorcycle or any other vehicle propelled by any power other than muscular power or any appliance or accessory thereof in a manner which unreasonably interferes with the free and proper use of the public highway, or unreasonably endangers users of the public highway. Reckless driving is prohibited. Every person violating this provision shall be guilty of a misdemeanor. If you are facing this charge, give our criminal defense lawyers a call to learn how we can help you. We can be reached at 800-893-9645. The Manhattan Summons Part is located at 346 Broadway in downtown Manhattan. 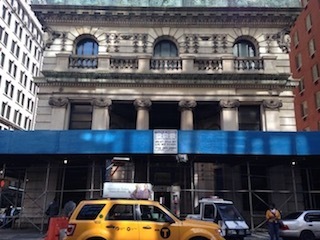 It is two blocks south of Canal Street and easily accessible from several major train lines. There are two courtrooms located on the first floor. Your case will be in either Part 1 or Part 2. Upon arriving to court, make sure you check the court’s calendar to make sure you go to the right courtroom. If I don’t have a lawyer, do I have to appear in court? A defendant is required to appear in court on all misdemeanor charges. The failure to appear in court can result in an arrest warrant being issued. If a defendant hires our law firm, their appearance in court may be waived. An arraignment is the official start of a criminal case. At the arraignment, a defendant has the right to have their charges read in open court and must enter a plea of either guilty or not guilty. Our criminal defense law firm has over 30 years of legal experience. We are led by a former New York City prosecutor. If you have a legal matter pending in 346 Broadway, give our law firm a call today at 800-893-9645.